African Americans and Hispanics are hardest hit by the growing epidemic, the statistics show. It is difficult to predict just how many people will develop Alzheimer’s, the most common cause of dementia. But as more people live longer, the numbers will inevitably go up. “CDC researchers predict that Hispanic Americans will have the largest projected increase due to population growth over the projection period,” the agency said in a statement. "The U.S. population of persons aged 65 years and above is expected to double from 46.5 million in 2014 to 83.7 million by 2060, but some groups will increase much faster than others," the team wrote in their report, published in the journal Alzheimer's and Dementia. African Americans have the highest percentage of Alzheimer’s by population, with 13.8 percent of blacks aged 65 or older affected. More than 12 percent of older Hispanics have Alzheimer’s, while 10 percent of whites over 65 have the disease. 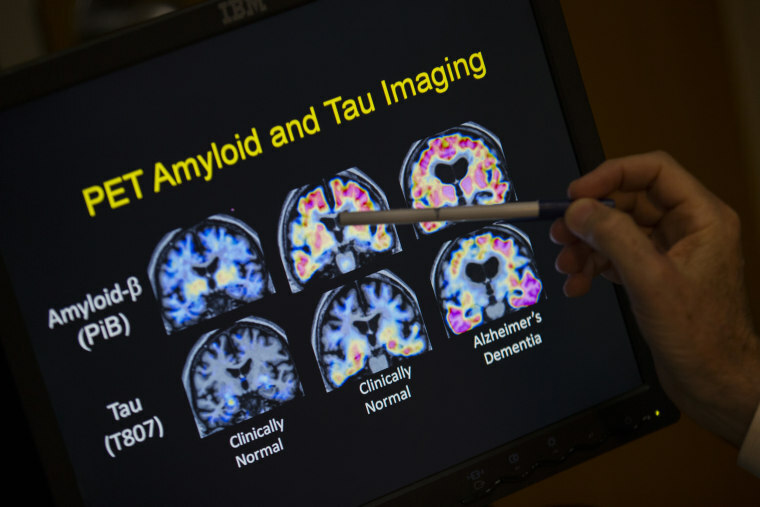 “This study shows that as the U.S. population increases, the number of people affected by Alzheimer’s disease and related dementias will rise, especially among minority populations,” CDC Director Dr. Robert Redfield added. The CDC team used Census and Medicare data to make the projections. There’s no cure for Alzheimer’s, which is now the fifth most common cause of death for people aged 65 and older. There are not even good treatments yet, although labs are working to develop something that can stop the progression of the brain disease. Studies show that millions of people have signs of the damage that can progress to Alzheimer’s, although there no good way yet to predict who will develop symptoms and who will not. “If you count how many people have the pathology in the brain that says they’re on their way, that goes up to closer to 20 million,” Dr. Rudolph Tanzi, a neurologist and Alzheimer’s specialist at Massachusetts General Hospital and Harvard Medical School, told NBC News in a Facebook Live conversation Friday. Alzheimer’s is also difficult to prevent. Lowering blood pressure is proven to lower the risk considerably, and exercise appears to help at least delay symptoms. What’s most important, Alzheimer’s experts agree, is getting a diagnosis early enough to prepare for possibly years of worsening disability. “It is important for people who think their daily lives are impacted by memory loss to discuss these concerns with a health care provider,” said Kevin Matthews, a CDC health geographer who led the study team.